The U.S. Patent and Trademark Office last week opened a new exhibit honoring Steve Jobs at its museum in Alexandria, Virginia. Located in the atrium of the office’s Madison Building headquarters, the free museum offers interactive exhibits, a portrait gallery and a theater. 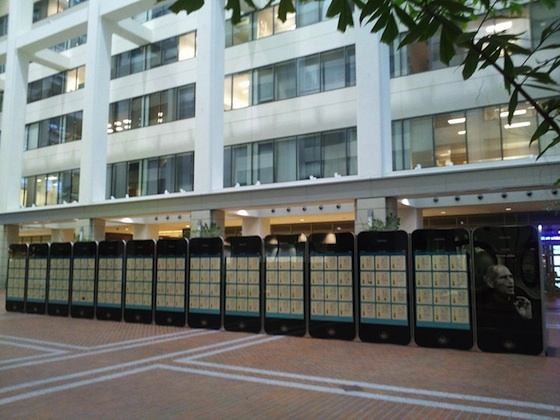 The Steve Jobs exhibit consists of 30 giant iPhone-like display panels, most of which display the front pages from over 300 patent and trademark filings that bear Jobs’ name as inventor or co-inventor. The remaining panels offer a brief description of the exhibit and photos of Jobs. 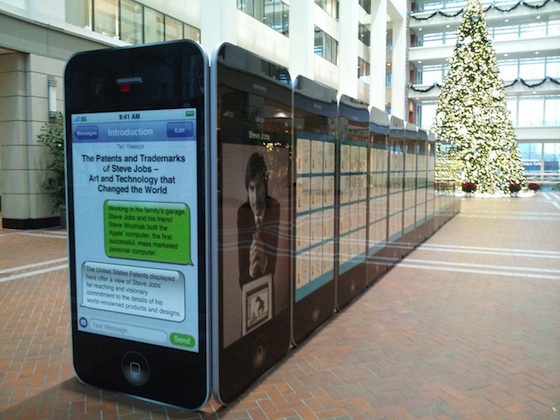 The Steve Jobs exhibit at the USPTO Museum runs through January 15, 2012. 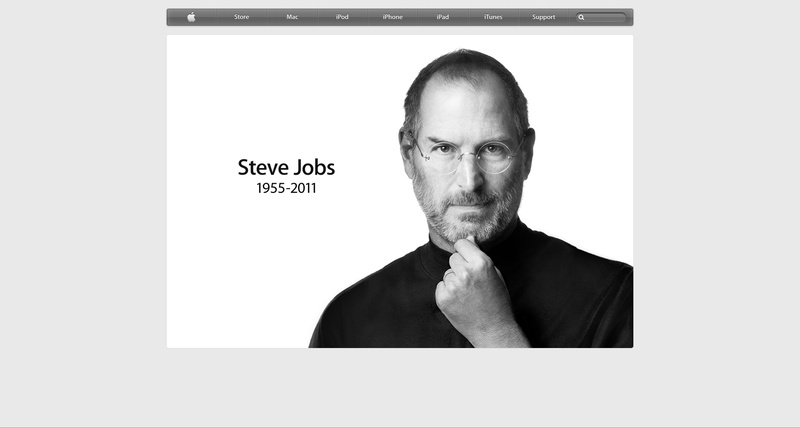 Bloomberg accidentally posted the obituary of Steve Jobs today. The post has since been brought down, and a retraction has been written, but the release caused quite a stir. It is common for new organizations to write big stories in advance, and then fill in the specific details when the event happens. The health of Steve Jobs has been bantered about for years now, and reached a new peak when he resigned as Apple’s CEO last month. Bloomberg staff was apparently updating the article when someone inadvertently published it. Accidents happen, but it is particularly unfortunate that someone should be faced with a record of their own death. The obituary also included a number of reporter’s notes about how to complete the article; the names and phone numbers of which friends and family to contact for comment, including co-founders, ex-girlfriends, politicians, and competitors, was particularly macabre. It has been reported that Steve Jobs’ authorized biography, was initially slated for a March 2012 release but has recently been bumped up to a November 21st debut. This will be updated to include details on his resignation as Apple CEO, which occurred yesterday. 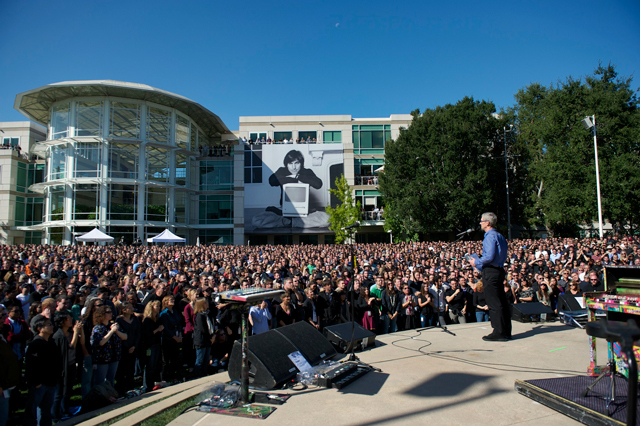 The biography, simply titled “Steve Jobs”, is the first authorized look at Steve’s life. It is being written by former Time managing editor Walter Isaacson and is based on over 40 interviews with Jobs and additional interviews with over 100 colleagues, friends, and family members. Jobs has offered his complete cooperation with the effort, making no subject off-limits and not requesting the right to review material before publication. This content is not mine. Steve Jobs co-founded Apple Inc, in 1976. Steve also co-founded and was the CEO of Pixar Animation Studios, which created some of the most successful and beloved animated films of all time including Toy Story, A Bug’s Life, Monsters, Inc., Finding Nemo, The Incredibles, Cars and Ratatouille. Pixar merged with The Walt Disney Company in 2006 and Steve now serves on Disney’s board of directors.